September marks the beginning of strudel time at my house. My husband’s birthday is at the end of the month and one of his only requests of me is to make some strudel. Easy enough! 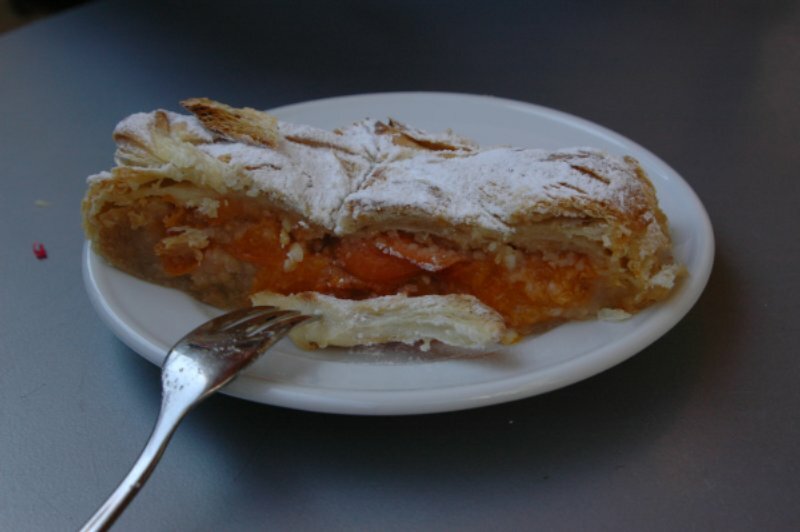 You see, my husband is from Germany and has a deep addiction to apfelstrudel (apple strudel). When we were dating, I thought it would be nice to try to make one for him to remind him of home and let him know that he was in capable hands here in America. My first strudel came out good– nothing in my opinion to write home about, just good. Of course, he tells me that mine is the best of all the strudels he’s had in his lifetime. Trust me, that’s A LOT, but I know he’s only being kind because I’ve tasted those other strudels; I haven’t quite got it down yet. During our vacation this summer we spent a lovely day in Salzburg, Austria. 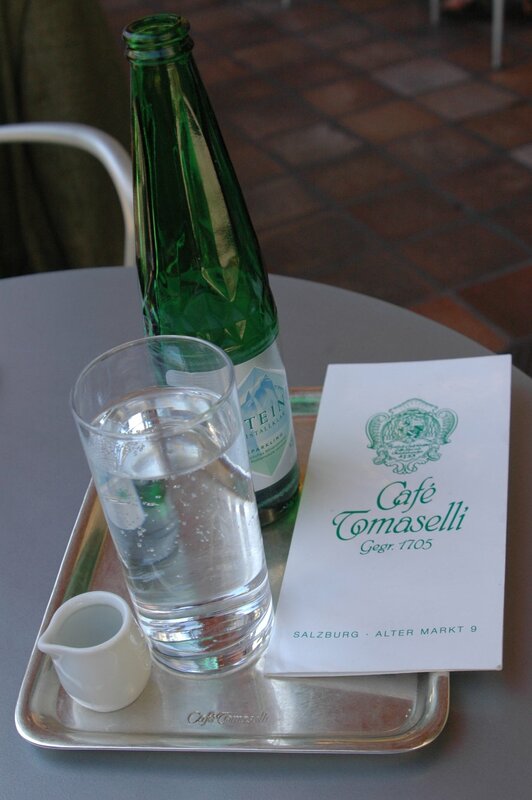 It was the second time that I’d been there, and I knew that I wanted to go to Cafe Tomaselli- the perfect destination for some tasty Austrian strudel eating. 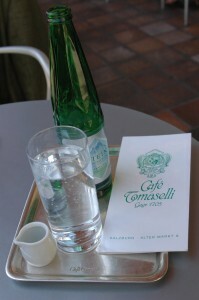 The cafe has been around since 1705 and was once a favorite of Mozart. The Tomaselli family still runs the cafe today! Impressive, eh? Summer is the height of tourist season in Salzburg, but we were lucky enough to grab a newly vacant table outside with a great view of the old market area. We ordered drinks and were patiently awaiting the tray of desserts to make its way over to us. We had many strudel temptations throughout the day: the local farmers’ market, Cafe Sacher, the restaurant where we ate lunch; they all offered tasty looking strudels, but we were testing our patience and waiting for the right one. Lo and behold, the dessert tray comes around. What do you know, there’s no apfelstrudel! I know what you’re thinking. Tragedy, right? For a moment that was the same thought I had. My husband and I looked at each other like we had just received news along the lines of someone being in an accident. But, not to fear…. there was marillenstrudel on the tray. I had not a clue what marillenstrudel (apricot strudel) was, but my husband looked relaxed and happily positioned his fork in front of the plate. I guess it doesn’t matter what kind of strudel he gets as long as it has strudel somewhere in the title, he’s a content man. Most importantly, all of this has inspired me to do a little research on strudel making because I want to get it right. Now that I’m that much more educated and equipped, I thought it would be nice to share with you. The recipe below was lovingly translated by my husband (he knows he’ll be getting some strudel now!!). Knead the ingredients of the dough until smooth and let sit for 1/2 hour. Cut apricots in thin pieces. Beat egg white and 11/2 oz. sugar. Once egg whites are foamy, add remaining sugar and starch while beating the mixture, then add the almonds and spices. Stir egg yolks, egg white mixture and apricots together. Preheat oven to 400. Halve the dough and roll each on a flour-dusted kitchen towel. Pull the rolled dough to a rectangle and fill the lower third with the apricot batter. Roll dough up with aid if the towel. Close open ends of the strudels tightly and roll them onto a pre-greased cookie sheet. Baste with butter and bake for 25-30 minutes. Serves 4-6 people.